Located just seven kilometers from St. Francis' Assisi, Il Borghetto di Assisi offers a wonderful environment and location for a family reunion or gathering of friends. The views through the olive groves and trees over the valley are expansive with the sweet medieval village of Sterpeto nearby on the neighboring hill. The bells from its parish church can be heard in the distance creating a relaxing and soothing ambiance. This characteristic stone farmhouse dates back to the late 1700's and is very representative of the Umbrian "fattorias" of the time period. The buildings are built of warm stone accented with the deep colored wood shutters that are typical of this type of architecture. The lower ground floor was used as a stable in former times and this level has been transformed into a spacious living and dining room. The metals rings where the horses and donkeys were tied have been maintained in the stone to remind of us of an era gone by. Today, this vast living area has been furnished with sofas, a handsome raised fireplace and doors that open out onto the garden. Historically, the living areas were above the stable (ground floor) and graced with a distinctive stone loggia. This characteristic feature has been nicely maintained and the loggia at Il Borghetto di Assisi leads to the upper floor where the bedrooms are located. The owners of Il Borghetto di Assisi have paid very careful attention to the original features and integrity of the building retaining the 18th century layout and using appropriate materials. Wood beamed ceilings, exposed stone walls and interior brick pillars attest to special care with which the restoration has been carried out. The furnishings are especially noteworthy. The talents of local artisans have been used in creating handcrafted pieces of furniture, unique lighting, painted headboards and warm and welcoming fabrics. The quality is superb. A high level of comfort and modern features create an attractive and very comfortable accommodation. Accessed from the covered loggia, the bedrooms are on various levels and all offer great views of the surrounding countryside. The house presents a variety of kitchen/dining areas, bedrooms and bathrooms throughout the house, thus offering a number of sleeping and living options. 12 people (main house) - The main house sleeps 12 people (6 bedrooms/6 bathrooms). 16 people (main house + one apartment) - A separate cottage offers two apartments that connect internally. Each apartment sleeps 2 + 2. 20 people (main house + both apartments) - Members of a large group or family seeking an extra degree of privacy will appreciate the flexibility of this arrangement. 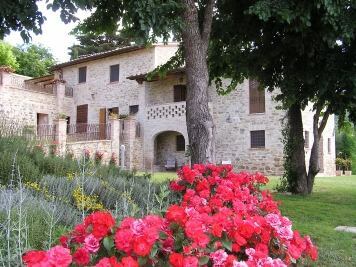 The well maintained grounds surrounding Il Borghetto di Assisi gracefully and completely complement the house. The large swimming pool (14m x 6m) with the furnished deck sits in a panoramic and sunny position. The landscaping is graced with mature trees and large areas of grass. The various terraces feature flowering and aromatic plants such as lavender and rosemary offering a wonderful fragrance as you walk along the gravel paths. For all the combinations, guests have exclusive use of all of the outdoor and garden areas. There is also a barbecue, private parking area and table tennis. The cleaning of the kitchen areas and bathrooms is included for rentals longer than one week (done on Saturday morning). Satellite TV and fast Internet service are available for a small fee. Ground floor: Accessed from the outside and also by an interior stair case from the lower ground floor. Includes an entrance foyer, kitchen oven, freezer and dishwasher, passage sitting room, bathroom with shower and washing machine. Lower ground floor: Large living room with dining area (fireplace, TV, DVD, CD). Access to the garden. First floor: Accessed from an external staircase from loggia: Kitchen/dining room (TV). One double/queen bedded room with en suite bathroom with shower, one twin bedded room (2 singles), one bedroom with double bed, one bathroom with shower. Stairs lead up to upper level. one queen/double bedroom; One bedroom with double bed; 2 bathrooms with shower, one queen/double bedded room with en suite bathroom with shower. Kitchenette/dining room with low vaulted ceiling. Access to upper level terrace. Ground floor. Living room with sofa sleeper, kitchen area and TV, one double bedroom, bathroom with shower.